Hi Arielle! Tell us a little bit about yourself. 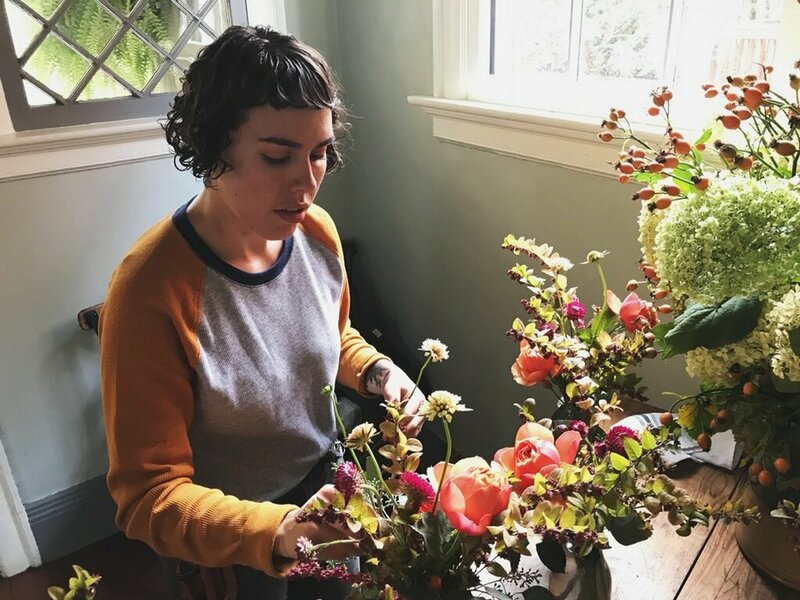 I’m a painter and printmaker based in Portland, OR, as well as a tiny organic flower farmer and florist under the name of Small Yard Flowers. I play instruments and the occasional mouth trumpet. I have two cats, Mr Mike and Murphy, and three silly runner ducks named Doris Day, Biggie Smalls, and Billie Holiday. I also have a poison dart frog named Sweet William. I cook and laugh a ton with my husband, Kyle. I acquired the gist of my artistic education at the Oregon College of Art and Craft (OCAC) here in Portland, where I was able to dive into numerous creative mediums like bookbinding, letterpress, printmaking, metalsmithing, woodworking, painting, etc. Here I was able to exercise my hands and learn what craft really meant. Before art school, I was the art and music nerd that ate lunch in the art room and painted whatever I wanted during class. And before that, I was a 3rd grader who saw Titanic and thought it was OK to draw naked people all the time. My teachers did not agree. When did you begin working on painting and printmaking and how did that transition into becoming a regular activity in your life? Painting began in middle school and developed through high school. It was also in high school when I was introduced to a screen printing machine, and I’ve been in love with print and paper ever since. But it was art college that taught me about having a healthy amount of studio time outside of school and work. And despite having full-time jobs all through school, I made it a point to be in the studio as much as possible. 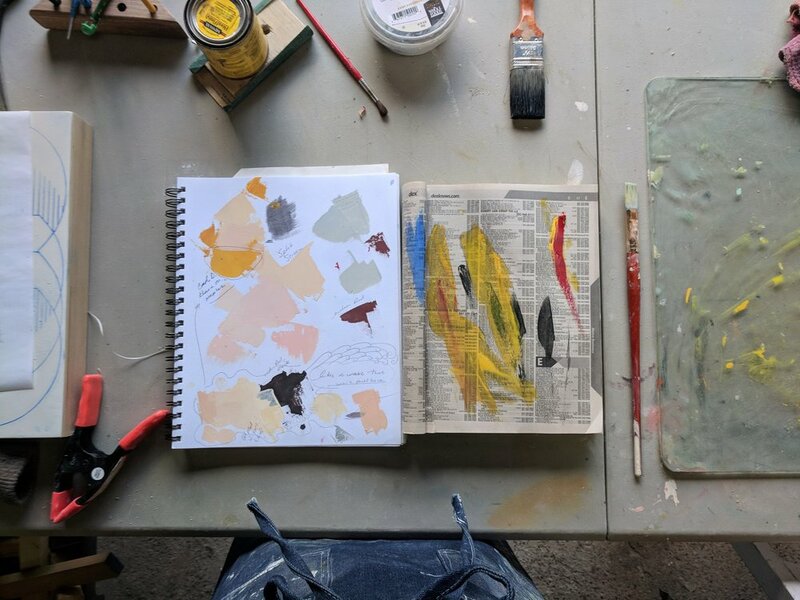 My studio practice really evolved and became a steady affair after my husband and I bought a house a few years ago; I turned the garage into my studio and I dedicate about 4 solid days a week to painting and printing. What does your creation process look like? My process starts silently and secretly in my mind; my paintings often come to me first as color combinations, and then form follows. I see it fully in my mind first, and after thinking about it, I’ll scratch a rough sketch of shape and line on a piece of paper, and then start the physical creation. I build my panels myself, and I prime them with joint compound--the same substance one would use for drywall. This material is soft and sandable, allowing me to scrape lines and dashes into it with dental tools. I cover the whole panel with my carefully chosen colors, in the form of diluted oil paint, and once that is dry, I sand and scrape the surface of the panel so that the majority of the pigment is gone except for what was layed into the carved lines. My printmaking process is a little different. I have a small table-top etching press that I pull all of my monoprints from, which limits the size I am able to print--it’s a nice change from my large paintings. My prints are intuitive and are quick to fruition. I use torn paper and old plastic produce bags as “plates”: I ink them up, send them through the press, and I keep whatever ones have a compelling texture and form. Do you have a favorite piece or exhibit that you have done? My favorite is a commission I did for the new HiLo Hotel in downtown Portland. It’s my favorite because I was able to paint the largest I’ve ever painted before. I believe my work is best in large scale, and I’m drawn to large scale paintings like those done by Rothko and Agnes Martin, so I was excited to have a reason to go big. The lobby and conference rooms of the hotel are incredibly beautiful and well designed, and my work seems to be happily at home there. It’s practically outdoors. OK, in mid January when it 30 degrees and pouring rain and sleet, I sometimes wish I had a nice cozy studio in a hip loft somewhere, but I just turn on the space heater, pull on long-johns and insulated boots, and close the garage door. It’s not an attached garage nor is it insulated, but it gets the job done. In the summer, I’m able to leave all the doors open, which allows me to be steps away from my garden, and also my three ducks like to say hello from time to time. I spend 70% of my time outdoors, and I love to flow freely from studio to garden, to kitchen, to compost pile, to studio again. And since it’s a dirty old garage, I’m able to be as messy as I need to be. Sanding wood and drywall is a messy procedure. I draw inspiration from shapes and colors I find in everyday life: the cobalt blue of a dumpster, the shapes left by someone trying to cover up graffiti with mismatched paint. I’m a highly sensitive person, as many artists are, and I’m constantly aware of the emotion and language in everything I see and hear. The thing about “formal” art, which is what I consider my paintings to be, is that it cares only about the language that exists between the forms and colors it encompasses, and it doesn't try too hard to be anything else. Emotion is created within those relationships, but it’s simple, uncomplicated emotion. The only other thing it concerns itself with is its surroundings, its neighborly architecture, the spaces it lives in as a painting. It doesn't care whether the viewer sees something in it, or tries to build a narrative for it. It's the same with the everyday inspirations...the dumpster is only blue and is only a dumpster, and those two buildings make an interesting negative space by accident and it’s beautiful...that’s all. Could you tell us more about Small Yard Flowers? When did you begin it and where did the idea stem from? Small Yard Flowers is brand new - only six months old. But leading up to the actual business formation, I was doing weekly flower arrangements for my husband’s restaurant The Waiting Room and for friends and family. My mother, knowing how flowers have been an important part of my life since I was younger, lightly suggested starting a flower business and providing flowers for other businesses and maybe opening a storefront. The brick and mortar concept is something in the works for the future, and for now it’s an operation I run out of my own home and garden. My work quickly steered into the wedding realm, an inevitable path for most florists, and it’s been a lovely learning experience. Your arrangements are stunning! Did you do any previous work in floral design or was it something that you just felt drawn to create? My background in floral design is not immense, but it’s a little precious. Flowers have been a passion for me for a long time; I’ve been building bouquets from foraged material for my mother since I can remember, and my desire to have a flower garden has been a deep yearning ever since I read The Secret Garden at a young age. My life has always been growing alongside flowers, but it wasn't until a little while ago that I thought it might be a good idea to put my passion into a profession. My intention is to directly serve my community, my neighbors. I want to have a presence in St. Johns, the little nook of Portland I love and live in, and when the brick-and-mortar comes to fruition, it will absolutely be in St. Johns. I'm excited for my customers to know that the majority of the flowers I use come from right down the street from them, or if they live elsewhere in Portland, then the flowers come right from across town. And my garden will always be open to those who visit or just happen to be walking by. Since this coming year will be my first full season of growing and selling flowers, I’m expanding the cut flower garden into every inch of the front and back yards, so there will be as much to offer as I can out of my small yard. Portland is also very organic-driven and passionate, and so am I. I think that providing organic, small scale “slow flowers” resonates with people, and knowing that I’m doing my part in keeping my community and neighborhood clean and chemical free is important to me. I’ve also applied to have a booth at the St. Johns Farmer’s Market so that the people of North Portland can have easy access to ethically and sustainably grown flowers for their kitchen counter. It’s incredibly important because at the root of community, there is craft. Whether that craft be brewing beer, basket weaving, pottery making, or shop-running, it is a passionate, difficult feat and we throw all of ourselves into it. Craft connects people and gives humans purpose. By shopping small, money stays in the community and provides support for makers to keep making, which in turn keeps beautifying your community, which then makes your community happier and healthier. Supporting local businesses instead of larger conglomerates, big box stores, or online mega suppliers, also cuts down on your individual footprint. Every Amazon order that comes in separate boxes, every trip to the shopping mall on the other side of town, every piece of pottery flown in from China, every bundle of un-seasonal flowers shipped from South America to your local Safeway has a humongous impact on Earth. And if everyone in our communities could focus a little more of their attention to the quality made right in their own city, their own neighborhoods, the planet would be thankful, and the small businesses would stay in business. Small businesses help retain the Soul of a community. I’ve grown to love the worm, the spider, the moth--the little things that keep an ecosystem flourishing. Each garden is an ecosystem, and knowing that I add to that ecosystem beneficially by gardening organically and composting everything I can is what makes me excited. I’m constantly amazed at the ability of a tiny seed no larger than a speck of sand can flourish and grow into a yarrow plant. I’m amazed that my ducks know where to find all the slugs so that I don't have to use harmful slug baits and poisons. I’m passionate about the natural world and extremely passionate about how happy a bouquet of flowers can make a person. I believe flowers keep us young--they keep our childish innocence burning and alive. When it comes to my art practice, I’m passionate about creating visual ease and comfort. There’s nothing that makes more sense than the right painting in the right environment. When a painting talks to its surrounding architecture, there is a relaxation of space and the tension is eased. It’s mostly subconscious, but it’s powerful. Essentially, with both my art and my flowers, the use of my hands is paramount; I am a true believer that busy hands make a happy heart...messy hands even happier. What are some of the setbacks or challenges you face in your art and business? A big hurdle I constantly have to jump is stepping out of my comfort zone. I’m an introverted person, and I’m perfectly content getting lost in my studio and garden. But you have to step out into the world or else your business will fail. Don’t get me wrong - I Iove people and a good social gathering, but it takes a little more effort for me to promote myself, to make connections, and to socialize. But I do it, nonetheless. I believe I have something to offer the world, and If that means breaching the boundaries of my bubble, I’ll do it. Another big hurdle is dealing with failure. There isn’t one business owner or artist that hasn’t dealt with various degrees of failure. For me, this could mean a miscommunication with a flower client, a failed painting, a whole sowing of seeds dying, or not filing my taxes correctly and having to owe a bunch of money... I’m a grown up who’s still learning how to be one. A lot of us are. But all the failures fall to the wayside when I see the face of a bride who just got her bouquet, or when I have an amazing turn out of friends and collectors at an art show. It all comes in one big package. It’s so so important because if we don’t support each other, who will? There are way too many obstacles we have to jump to keep up and to hold a footing in this male-dominated world, and we should do all we can to help each other raise to our capabilities. We need to help each other accomplish and prove that we are some of the best innovators, makers, and lovers the world has to offer. Also, a thing that women are really good at is learning from others and seeing the world as a large, connected community that thrives with cooperation, caring, and sharing--whether that sharing be of information, ideas, or the simple, ancient form of seed sharing. We are in it together, and we know we’ll fall short if we succeed by stepping on other people or by highlighting other’s shortcomings. So many women are inspiring. If I were to name an artist from the past, I’d say Agnes Martin for having such a true, clear eye on emotion and intuition and for giving modernism and abstract expressionism a female face amongst a very male-centered art world. In the gardening realm, I find Gertrude Jekyll incredibly inspiring. She was a horticulturist and garden designer in the later 1800’s and early 1900’s, who had amazing insight and opinions on gardening, especially English roses. But the women I find most inspiring are my two sisters, Jasmine and Tessa. Jasmine is a designer at Adidas and an elite track bike racer, and Tessa is a maintenance technician and a world traveler. They are both so magnificently creative and talented, and I feed off of their energy and drive to be empowered and generous women. We understand each other like no one else does. We have always been each other's support in a world where we felt misunderstood for so long, and we give each other the strength and voice we lacked growing up. My husband has been the most helpful tool in the shed. He is the one who walked me through the steps and hurdles of opening a business, he’s the one helped me write a business proposal, and the one who gives me advice on all things small business related. Another great tool in the shed has been Instagram and social media. I’ve met so many like-minded, small business owners, I’ve learned so much from what they have to offer, and I’ve been able to network and build my presence through the social platforms. There is never a short supply of people willing to share their stories and tips on running a small scale organic flower farm, and never a short supply of inspiring art that keeps the gears turning. And then there’s Powell's... I could spend days and days gleaning information and inspiration from the shelves of the gardening aisle and from the Pearl Room, where all the artists live. If there is something you need to know, and you wanna actually put your hands on it, Powell's is the place to go. But go late at night: you’ll avoid the tourist crowds and you’ll have the aisle to yourself. How do you manage moments of self doubt? I suppose a lifetime of practice has toughened me up! But really, there isn’t a day that goes by where I question myself. I’m often worried about how I’ll pull off a project, or worried if I have what it takes. It’s inevitable to get lost for a second in the consuming swell of doubt. But I accept and manage that swelling doubt by reminding myself of the reasons why I do what I do, and why it’s important. Floral design isn't just a job, it’s an escape and a chance for me to keep my hands in the soil and grow what I create. Painting and printmaking isn't just an obligation to put years of expensive schooling to work, it’s an overwhelming desire that’s been inside me since forever, and if I don’t feed it, I die. You can’t doubt these things. So I guess what I’m saying is that there is a lot of doubt, but essentially there are things you absolutely can’t doubt, and those things will keep you afloat. Do you have someone that helped shape your work in a formative way? My mother played a big role in shaping my flower life. She taught the ways of her green thumb to me, and It’s because of her and the hundreds of hours we spent together, and still spend together, picking out plants and digging holes and admiring other gardens. My art life has been shaped by numerous hands throughout my life, but one pair of hands that have always been supportive and paramount to many of my successes belong to Michelle Ross, a renowned painter and head of the Painting and Drawing Department at OCAC. Not only has her wealth of knowledge and support as a professor been an aid to my career, but her own amazing talents as an abstract painter have been so inspiring. She continues to be an influential voice in my ear, as well as a friend. Kelley Point: a slice of heaven amongst industrial complexes, car lots, and shipping containers. It's at the tip of the St. Johns Peninsula, where the Willamette river meets the Columbia river. It’s full of native plants, tall trees, sandy beaches, bike paths, and picnic areas. Cathedral Coffee: a coffee shop in St. Johns. I don’t drink coffee, but it’s here where Kyle and I can walk to with cribbage board and deck of cards in hand, and where Kyle can get what he considers an amazing espresso or cortado. It’s where you go to take a break from being in one of those stiff, sterile coffee shops on the east side. It's the best place to beat your husband in a round of Gin Rummy. 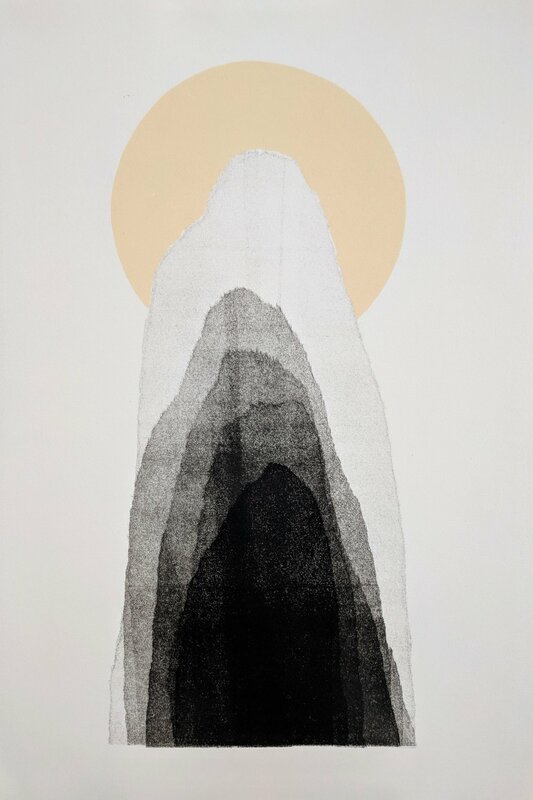 Greenberg Collection at the Portland Art Museum: It's in a wing of modern and contemporary art, and it's in Greenberg's Collection where you can stand intimately close to masterpieces created by Greats like Rothko, Jules Olitski, Kenneth Noland, Franz Kline, and Helen Frankenthaler. There's even a little Agnes Martin. It’s my happy place. City Farm: St. Johns farm and garden supply store. Best folks ever. Where I go for seeds, duck food and straw, canning supplies, potted plants, and genuine good conversation.